The stamp of course is the 1908 Quebec Tercentenary Issue and has a catalogue price of $100 for fine. Well the collector has just purchased this one from Mr. Fellowcollector for $30, which shows that us dealers who are selling this same stamp for $65 are just a bunch of greedy people. 2. Their experience in purchasing collections from auction houses, in which they can buy collections of Canada or any country they want at 25-30% of Scott. 3. Their experience in trying to sell their collections to dealers who often offer between 10-15% of catalogue value for their "collection". In many collectors minds, all of this is evidence that dealers are unscrupulous and take people's collections for a song and then turn around and charge two to three times what the stamps are really worth. Wholesale and retail markets are completely different. "Good" deals are often not what they seem. Not all collections are created equal and when you sell to a dealer you are operating in a wholesale rather than a retail market. An auction house is a wholesale market. Yes, these businesses do sell high quality, valuable single stamps. But what makes them a wholesale market is the fact that their relationship with the customer is largely transactional in nature and there is little to no ongoing service provided with the product. To illustrate this: when was the last time you got a call from an employee of an auction house saying "Hey Mr. X, we just got a consignment of Large Queens and I happen to know that there are several pieces in this sale that are right up your alley."? Or say you purchase a collection of Canada for several thousand dollars and as you are going through it you notice that the Bluenose stamp that you thought was VFNH has a corner crease. What then? You see the disclaimer in the auction catalogue that says "lots with more than 10 stamps cannot be returned under any circumstances". Or what if there were no damaged stamps, but the catalogue value was actually quite a bit lower than what they "estimated" it at? Can you call them up and say "Hi Mr. Soandso, I'm calling about the Canadian collection I bought in your latest sale. Yeah, it turned out to be a bit of a disappointment and I'm wondering if there is anything you can do?". Now, I'm sure that these businesses will make the odd exception to their own rules for their largest and most valued customers. But for the average collector who bids once a year? Not much chance. What about service to the hobby and promotion of the hobby? Have you ever seen major auction houses promoting philately in the community at large? How many blogs are there written by auction houses that aim to educate the customers about the product? Very few that I know of. Most wholesalers assume that you know all about the product and that you do not need them to educate you. This is a large part of the reason why they have such strict return policies. Caveat Emptor is the rule of the day when dealing in a wholesale market. 1. You will likely not find an individual 10c stamp for sale that has $60 as a suggested bid. Instead, most of the 10c stamps will be the much more expensive grades with suggested bids over $100, as auctions tend to shy away from offering individual items that they expect to sell for less than $100 each. 2. You will find an wholesale accumulation of 10c stamps, but to buy it you will need to spend several times more than you had budgeted. Then you have to find a way to sell the stamps from the lot that you don't want or need. This can be done with e-bay and the like, but takes a considerable amount of time, and there is always the risk of not recovering your cost. 3. You will not find any 10c stamps, but rather just whole Canadian collections that contain a 10c Quebec Tercentenary, and you have to buy the entire collection. 4. You don't find any Quebec Tercentenaries at all. The wholesale auction market works well for collectors who are highly knowledgeable about the stamps they are buying, who are not particularly concerned with obtaining a particular stamp at a particular time and who are happy to buy in much larger quantities than their immediate needs. These collectors are also comfortable with the whole concept of competing with other bidders and taking the risk of ultimately losing the item they have set their sights on. In contrast, the retail stamp market is completely service oriented toward the individual customer. A good stamp dealer builds a relationship with you and gets to know your collecting interests, your condition preferences and your budget. A dedicated stamp dealer will call you when something comes his or her way that he or she thinks will be of interest to you and is within your price range. Stamp dealers often promote the hobby within the community at large, by giving away stamps and collecting supplies to youngsters. Many dealers are happy to share their knowledge with you - sometimes for hours on end. A good stamp dealer also devotes his or her entire days to acquiring and maintaining an in-depth stock of material at all price ranges. They do this precisely so that should you decide that you need a mint Canada #101 for $60, you stand an excellent chance of finding one that you can afford that has been graded professionally and consistently by an expert who deals only in the stamps of his or her chosen field. The ability to collect at your own pace and add to your collection at your own convenience and by dealing with an expert is a service that many collectors find enhances their collecting experience. A good dealer is here to help you have the most rewarding collecting experience possible. For this reason they tend to stand behind everything they sell, so that if there is a future problem with a stamp they sold you, they will have a record of the sale and they will happily refund you or otherwise work with you to solve the problem. However, to do be able to deliver this very high level of customer service, a dealer must necessarily carry far more inventory then they expect to sell at any given time and consequently, must have a very large financial investment in the business. Indeed, they know full well that there is a percentage of their inventory that will never sell. The problem is, they have no way of telling which percentage that is, as it is next to impossible to predict what future collector demand will be. But what this does mean is that where they are offered material in large quantity, they cannot pay as much on a per stamp basis as they can for single items because they have to factor in the knowledge that some of those stamps are likely never going to sell, or at least not for a very long time. This brings me to my next point that not all collections are really collections to a dealer. To a dealer, a collection is a well organized assemblage of stamps and postal history that are individually salable, or is salable to a large range of customers as a complete lot. For example, a Canadian stamp album containing one of each stamp is a collection, since the dealer can either sell it as a complete album, can pick out some of the stamps needed for stock and sell the rest as a lot, or can break the entire album down for stock. If the quality is high and consistent throughout, then he or she most likely can pay more than 10-15% of catalogue for the collection, since it will contain much needed material that the dealer knows he or she can sell quickly. However, a large accumulation of 100 copies of each Canadian stamp from Scott number 34 to 300 is not a collection to a dealer. It is a wholesale accumulation, which will probably contain a lot of material that the dealer can never hope to sell and some material that they can sell easily. The problem is that for the dealer, it will take a lot of work to go through it to sort the wheat from the chaff and organize the stamps. Also, the dealer probably won't have many customers who want to buy the entire lot as received. All of these factors will affect what they can pay. This I believe, is often the scenario where someone goes to a dealer with $50,000 of catalogue value and reacts badly when the dealer offers them $2,500 for the lot. Many collectors fail to understand that when a dealer sells to them, they are receiving a service in addition to the stamps that they are paying for. The dealer cannot provide the service unless they can make a living doing it, and in order to make a living selling stamps at retail, a dealer's margins have to be very high to compensate for the very slow turnover in their stock. So why don't they just sell their stamps cheaper? Well because of the labour component. It takes time to retail stamps and if the price is low and the volume high, the dealer would have to hire many employees to handle the volume and the cost of doing that would likely make such a pursuit not worth his or her while. In addition when collectors sell to a dealer, they are also receiving a service from the dealer - that of a quasi finance company, like a factor of accounts receivable. They are able to liquidate their holding for cash on the spot and it becomes the dealer's problem as to how to turn that material over at a profit. So it is not possible for a dealer to offer collectors more than 10-15% of catalogue in most cases. It's not that they are being greedy, but rather the sellers are not understanding the differences between the wholesale and retail markets. I am a firm believer that ALL stamps have a value and a place. I am not one of those philatelists who thinks that any stamp should be destroyed for the good of the hobby. As stated in an earlier post, I am against the use of earlier stamps for "discount postage" because mint stamps are being delpeted and we don't know how many future collectors are being deprived of the chance to collect them. This one is very fine, with fresh original gum that has only been hinged once. It catalogues $300 in Unitrade and I have it priced for $180 USD. It is a nice, solid copy of this stamp. This stamp is the lower end of very fine, but is definitely better than fine. However, the gum on the back is not in its original state of freshness. I only know this because I am familiar with what the gum on these stamps is supposed to look like. A collector with only a passing familiarity with Canada, such as a general world collector or even a novice Canadian collector would likely not know that the gum is disturbed. I sell this one for $95 USD - just over half of the one above. This next stamp has fresh original gum as the first stamp above, but is just fine in terms of centering. It is a solid stamp for a budget conscious collector who wants sound, but not perfect stamps. It catalogues $100 in Unitrade. I priced it for $50 USD. This last stamp at first glance looks fine just like the one above. However under a loupe, you can see a very small tear above the "E"of postage and a small tone spot under the left 10. It is therefore at the bottom end of very good in terms of grade. Unitrade no longer lists prices for VG, but I priced this for $30 USD, knowing full well that I will probably accept a lower offer from a collector that wants it. At first glance, the stamps don't look that much different, but as you look closer you can see the differences in quality and the subsequent range in price from $30-$180. I'm still not asking 100% of catalogue, and I am disclosing the condition upfront and grade consistently. Lets go back to the first stamp I showed you above. The one bought from Mr. Fellowcollector for $30. It looks pretty similar to the one I have priced at $50, with one key difference: it has been expertly re-gummed. Again, the only way I know this is because the gum looks nothing like it should for this issue, and I know that because I have handled hundreds of these stamps over the past 38 years. Mr. Fellowcollector probably doesn't know either, if he is just a general collector. On the other hand, he might know and has priced the stamp to what he feels is fair for a re-gummed stamp. What would I sell this stamp for? Well it is actually in my stock and I have it priced for $28. In this hypothetical example, a collector would have bought this stamp for $2 more than they could have paid if they bought it from me, except that they wouldn't necessarily know it was re-gummed, whereas I would tell them upfront that it was. So the so called "good deal" is really just an okay deal from a collector that will disappear into the sunset, never to be heard from again. This is an example involving a single stamp. But what about buying collections at auction for 25-30% of Scott? Aren't those a good deal? 1. Many of the coil stamps from the Admiral Issue that I see offered are fakes made by either trimming the part perforate coil blocks, or re-perforating corner booklet singles with wide margins to resemble jumbo margined coils. You have to know the plate characteristics of the coils in many cases to tell the difference between the well executed fakes and the genuine stamps. 2. Many high value 50c and $1 stamps up to and including the 1930 Mt. Edith Cavell are expertly re-gummed, or have badly disturbed gum and you would never know if you were not familiar with the proper gum. 3. 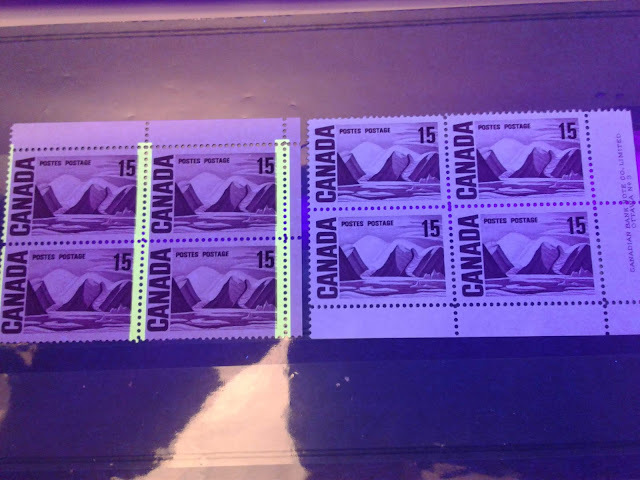 A very large number of imperforate pence issues from Canada, New Brunswick and Nova Scotia have been expertly repaired, and these repairs are very easy to miss if you don't know what to look for. 4. A large number of so called mint or unused Large Queen stamps are either re-gummed or cleaned used stamps that have been re-gummed. Again, close inspection with a good 10x loupe of a UV lamp would reveal the true nature of the stamps. 5. A large number of Admiral issues with straight edges have been re-perforated to produce well centered stamps and they can fool you if you are not careful. These are just a few of the problem areas that I see all the time and there are more. But my point is that if you buy a collection from an auction house, even if it is an auction located in Canada, there is a very high chance that it will contain some of these problem items that have been overlooked. This is not because the auction houses are being dishonest, but because they are processing such a large volume of material that they simply cannot check every stamp for these issues. So if you are buying based on catalogue and that value is inflated by the inclusion of these items, then you are really paying more than 25-30%. Another factor to consider is that auctions do not usually factor in condition when arriving at catalogue values on large lots and as we have seen through my above example, fine stamps are generally only worth half as much as very fine and very good, only half again. So if the collection contains a large proportion of stamps that are only fine or very good, chances are very high that the catalogue value may be inflated by as much as 100% or 200%. Thus if you are bidding more than 25% on such a collection, you may be paying the auction house more than I would charge you for the same material, and you are having to buy it all and pay the 10-15% buyer's premium that auctions charge on top of it. Now I have presented you with worse case scenarios that reflect well on me as a dealer. But just to be fair, I will say that there are many instances where buying a large lot at auction is a better deal than buying stamps individually from me. The best example I can think of is when you are just starting a specialized collection and you have no material. You want to get your hands dirty and don't much care what you buy - only that you can buy some quantity and get it cheap. Say you decide you want to collect Admirals in all their aspects - papers, shades, plates the whole shebang. In this case, it makes sense to go to the larger auction houses and spend several hundred dollars to a few thousand dollars on some larger accumulations of Admirals and go though them and study them. You can likely do that for less money than you would pay me or any dealer for the individual stamps. I would be happy to even help you buy such a lot. However, once you have become familiar with them and have a good working knowledge and know exactly what you are missing, there will come a point where buying more large lots just does not make sense because you will be buying the same stuff over and over again. It is at this point that a "sharp shooter" approach over the "shotgun" approach will make sense to you. Even at my prices, you will come out ahead overall once you factor in the money you saved on the large lots you purchased originally. So there is my take on the value that we dealers bring to the table and why we behave the way we do. I believe that most dealers are driven by passion for what they do and a genuine desire to serve the hobby. But the reality is that we have to be able to make a modest living doing so and this is much less easy than most collectors realize. Thanks very much for your feedback. I am glad to see people getting value out of my posts.